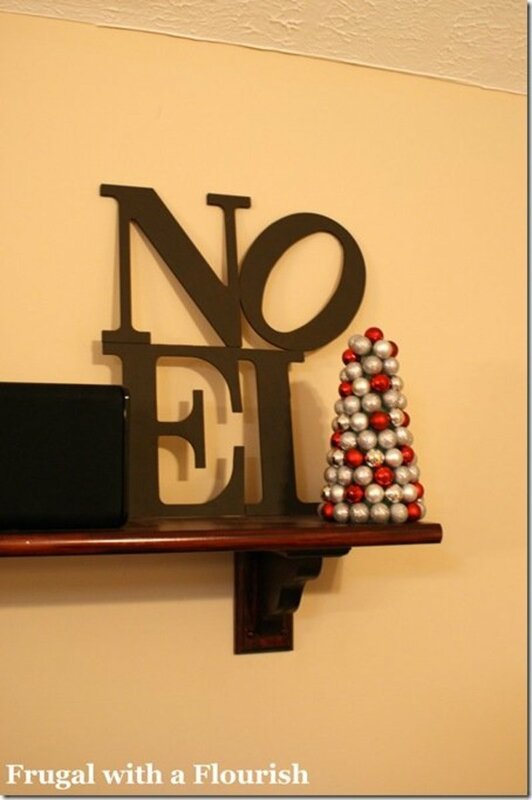 Looking for a Christmas Tree Theme? 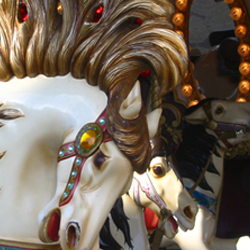 Why not try the Carousel Horse? As I've weathered the storm growing from a child to an adult, the magic of continuing a Christmas tree tradition has definitely changed. Some of my fondest memories as a child at Christmas are actually remembering the stories and events that were associated with a Christmas tree ornament-- even if the memory was illustriously illustrated by my child's eye. It was like a secret treasure trove box, only opened once a year, but displayed in full glory on a colourfully lit Christmas tree. As an adult, the sands of time have shifted as it's up to me to continue the tradition of adding one new ornament a year to the tree; but how now to pick an ornament? In the past as a child the unique christmas tree ornaments had been based on family vacations, and family moments. Now as an adult, my family had altered, split, and reshaped itself. Distances had grown between family members during the holidays, so choosing an ornament became a different task. 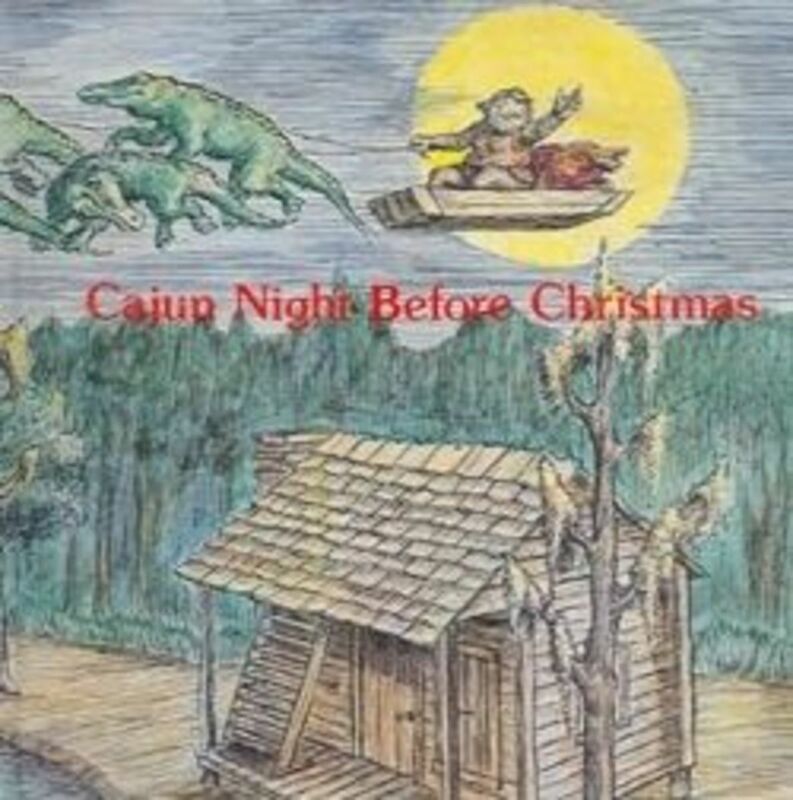 I still wanted the memory, but in a sense, the ornament hunting itself had to represent what my artistic eye was looking for, that link to the old Christmas's of the past. And in a strange way, I wanted my yearly ornaments to have a connection of sorts, despite my family's change in configuration. One year I happenstance to stumble across an old carousel horse ornament-- handed down to me by one of my very kind neighbours from my childhood past. She was an older lady who was very much part of our family (and many others on the street!) and she had recently passed away. But as I looked at the small weathered carousel horse ornament, I realized that it was the perfect ornament to collect yearly. An echo of the past, and a reflection of the present decision. 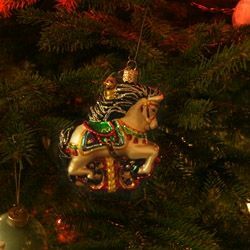 My love of carousel horse ornaments ironically has gathered (or at the very least) made my family smile over my unique Christmas tree with it's eccentric theme! 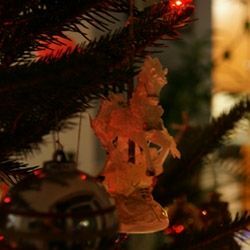 I chose looking for carousel ornaments for a few reasons-- I wanted something unusual in my Christmas tree ornaments, but I have always loved ornaments that have a small throw back to the Victorian Christmas trees. And ironically enough, perhaps some of my childhood fondness has crept through-- for there is nothing like the magic of a carousel horse-- choosing your steed, and oh how the imagination expanded the ride around that circle. When I was young, I crossed deserts, oceans, faraway fields on whatever bejeweled steed I chose on the carousel ride. I wanted to capture that imagination for the Christmas horse ornaments-- and transferring the magic of the carousel into the magic of Christmas through unique carousel horse ornaments made my adult self smile once again with that childish happiness. 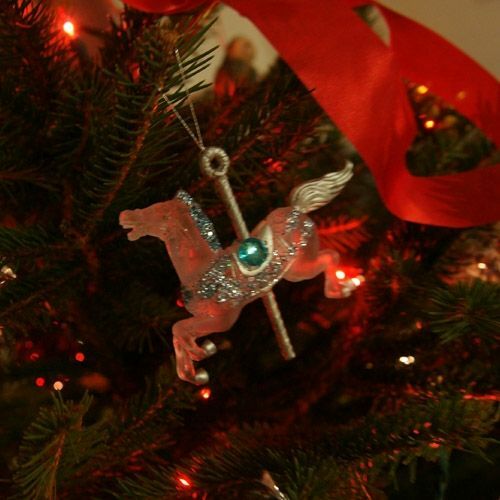 I won't lie, from a Canadian market perspective, Carousel horse christmas tree ornaments are very difficult to find. As I've been hunting for about 5 years now for them, I have to admit that the American marketplace has the best availability and options regarding christmas horse ornaments that are carousel horses. Rocking horses, regular horses, even horse head ornaments-- no problem finding those either side of the border. Don't even get me started about the availability of reindeer ornaments (probably a much easier theme by the way! *laughing*). But if you're up for a challenge, enjoy the hunt, carousel horse ornaments have some of the most beautiful artistry out there when you do discover them. And since they aren't that easy to find, it means you stay on budget each year for one or two unique ornaments! I've broken down the site into three categories: The Collector (focusing on Breyer carousel Ornaments), The Artisan (The Gorgeous work of artist Nene Thomas and her production of amazing Carousel Horse ornaments), and the Hunter (Places Offline where you can walk into stores and potentially find christmas horse ornaments). Since I'm Canadian I will note that the online market tends to be American, but sometimes one can find the ornaments in eBay or Amazon Canada. 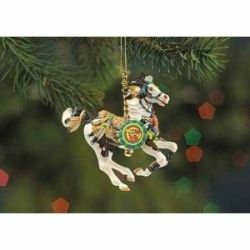 As far as actual stores you can drive to and possibly find carousel christmas horse ornaments I have a few places listed both side of the border, but they are limited to the Southern Ontario and Pennsylvanian range. Breyer's history actually began from molding model horses for a special order mantlepiece clock back around the 1950s. The horse model was so popular that people inquired with Breyer's if they did stand alone horse models, and today Breyer's is one of the most recognizable modelers and manufacturer's of exquisite equestrian collectables. (See Breyer's History, from http://www.breyerhorses.com). 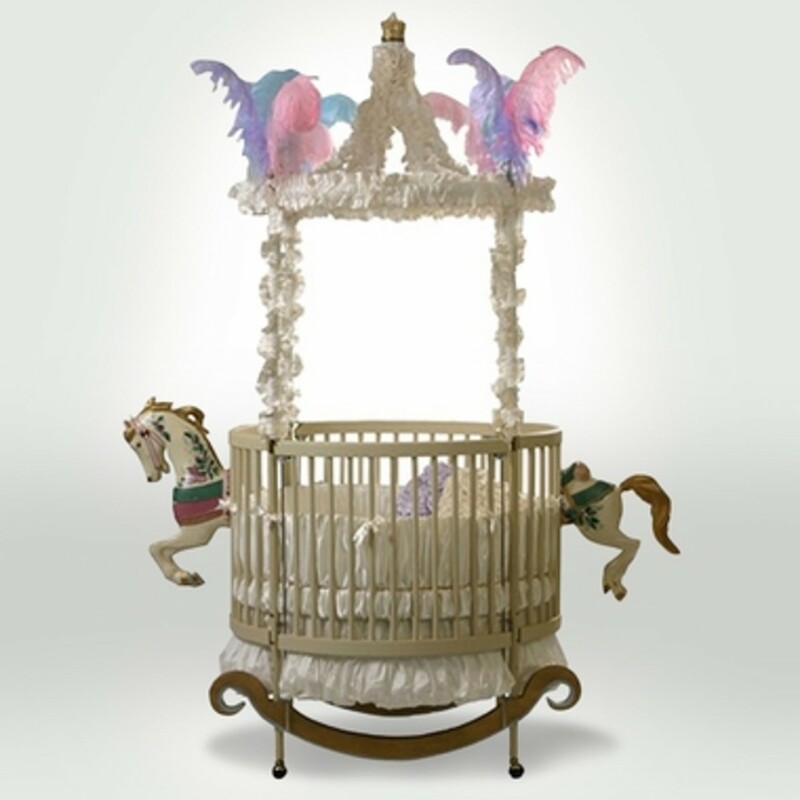 Great Stuff on Amazon - Great Selection in the Carousel Horse Market! I stumbled across Nene Thomas's work in my university years-- and it happened to be her prints. The imagination, fantasy, and detail in her work is like being allowed to look through a silver mirror to catch a glimpse of a rare world. 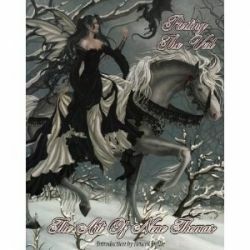 Lovers of the fantasy realm would be delighted by her work! To my excitement, Nene Thomas's work also spanned into ornaments and figurines, and her winged carousel horse ornaments are some of the most beautifully imaginative creations I've seen to date. They can be hard to find, and at times pricey, but in this case you are buying an individual artist's creation, pulled from her mind and literally molded into being. I find her carousel horses capture that magic of imagination gloriously, and weave another layer of christmas mystery! 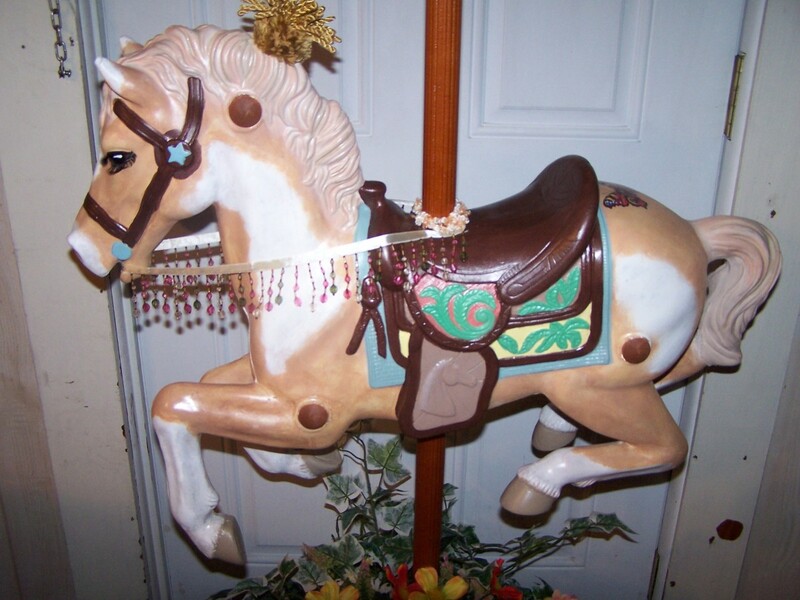 The Hunter - Roadtrips abound-- unusual places to find Xmas Carousel Horse Ornaments! 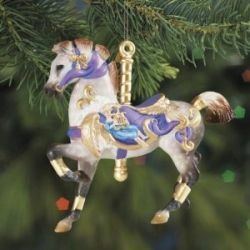 Roadtrip-- Link List - Unexpected stores I've found Carousel Horse Ornaments In! 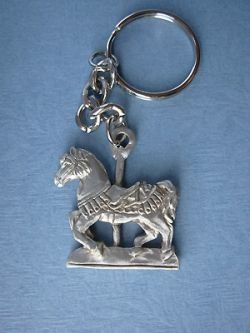 An example of one of the many pewter pieces Robert Hall Studios has to offer the inquisitive carousel horse collector! An incredibly patient and dedicated shop saleslady dug and hunted in the back storeroom for this ornament when I was in Country Cupboard-- I ended up with two-- a chestnut mane carousel horse and an ebony black mane carousel horse.